To make your bridal shower finger food more fun and easy to access, try making Hors d"Oeuvre flags using custom stickers and toothpicks. I came across this super easy idea at the Zazzle blog and just had to share it here. This is a low cost way of adding a personalized feel to your bridal shower buffet table and is so super easy to accomplish that anyone can do it, one... two... three! 1. 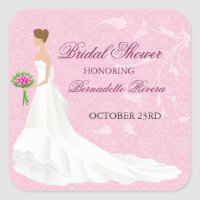 Simply order customized stickers to match your bridal shower theme. 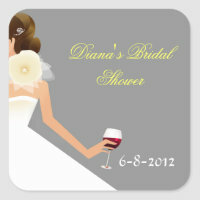 Zazzle has literally thousands of designs to choose from so you're sure to find the perfect one for yours. 2. Next, use two stickers (back to back) with a toothpick stuck between them to create the adorable flags to stick into the finger food and appetizers at your shower. 3. Then, stick them into your finger food and appetizers on your buffet table so that people can easily grab the tasty treats without making a mess. You don't need to use these on each and every piece of food for this to look good. Just a few on each platter will look great. Use plain toothpicks for the rest. Visit DIY Wedding Series: Bridal Shower Hors d"oeuvre Flags to see a pictorial tutorial of exactly how to put these together. Zazzle's small stickers are sold 20 to a sheet. They're easy to personalize and are the perfect size for this do-it-yourself bridal shower project. P.S. This neat idea also works well for baby showers and any other type of party that you'd like to add a bit of personal flair to. You can use plain toothpicks or match colors using colored toothpicks. Toothpicks photo appears with thanks to the photographer who made their work available through creativecommons.org. Click the pic to see the original source.